We decided to surprise our youngest son with a red Mini 12” Glider Bike for his 3rd birthday. 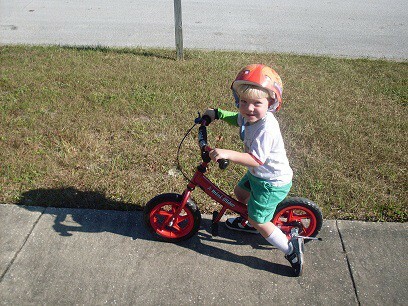 He had been riding a small bike with training wheels but we really wanted him to start to learn how to ride and balance on his own without coming to rely on those training wheels for the long term. When the box first arrived, my husband and I were shocked at how light it was….one very impressive feature of the Mini 12” Glider Bike is that it is only 8 lbs to make for safer learning and maneuvering. I thought it would take forever to put it together but in less than 15 minutes it was ready to ride. You should have seen Jacob’s face when his daddy presented him with his shiny red Mini 12” Glider Bike. He jumped up and down and got so excited shouting, “My very own bike just for me?” Poor little Jacob is the youngest…..our kids are 3, 4 and 5 so he always got the hand me down bikes until the arrival of his brand new Mini 12” Glider Bike. He raced to put on his safety helmet and then got on. He wobbled a bit at first and I was afraid he would be a bit tentative since he is used to the training wheels. Then….he was off. I turned around for a second and when I looked back for him he was using his feet to “walk” the bike and then started moving a bit faster. By the end of the first week he was really learning to balance and was so much more stable and confident. 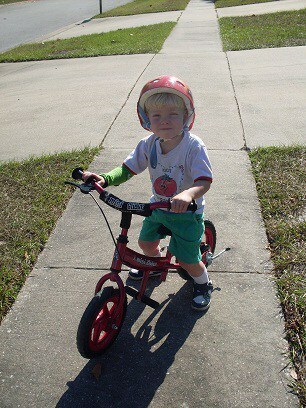 Before we knew it he was grabbing his Mini 12” Glider Bike instead of his old favorite with training wheels. He hasn’t yet pulled up his feet to glide but his big brother did demonstrate it much to applause of all the young kids in our neighborhood. In fact, when my kids are out riding it, we some how become the most popular house on the block. Do you want to see how it works? Check out the You Tube video “Introducing the Mini Glider”. My son really likes his Mini 12” Glider Bike. My only wish is that we should have gotten this as our children’s first bike instead of the traditional style with training wheels. 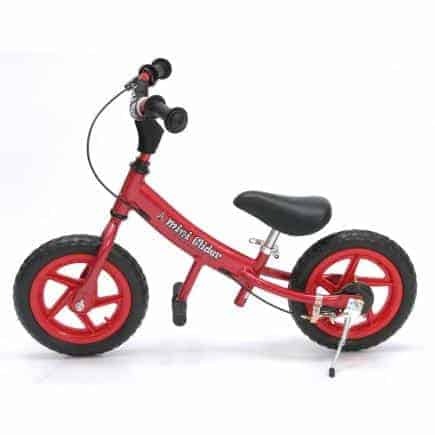 This is an excellent first bike and would be so much fun for any young boy or girl ages 2-5.